Saxon Homestead Farm is a fifth-generation family partnership owned and operated by Robert Klessig and Kathleen Block-Klessig, Liz and Karl Klessig, their respective families, and a team of dedicated employees. More than 170 years ago, in 1848, the family’s ancestors migrated from Saxony, Germany, to the rich lakeshore soils of Manitowoc County, Wisconsin, and began their legacy of American dairy farming and cheesemaking. In 1870, when their herd began producing more milk than the family needed, they founded the family’s business, Saxon Creamery, to preserve their cheesemaking tradition and share it with others. Saxon Homestead Farm is the single-source milk supplier for the creamery. Based on an efficient production system, rotational grazing, and no growth hormone treatments administered to their cows, the farm is committed to producing high-quality, Farmer Certified rBST-free Milk. The unique rind and paste of the creamery’s award-winning Saxon Snowfields Aged Winter Seasonal Butterkäse-style cheese are both a lovely, bone china hue. The cheese is made only from raw milk produced in the late fall and early winter, when the fat and protein content are higher. 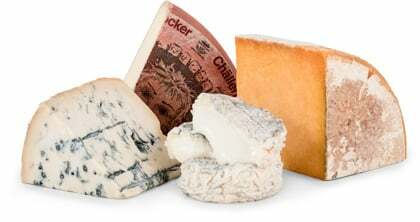 Because it is only made from batches of a single season annually, the quantities produced are limited and the cheese is quite rare. This is a superb eating cheese. 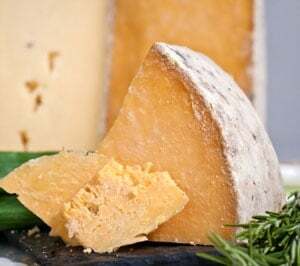 On the nose and palate, you will discover a mélange of warm, toasty, and earthy notes complemented by a buttery richness in this bold, flavorful, six-month-aged cheese. While its texture is predominantly rich and super creamy, there is also a crunchiness from the formation of lactic acid crystals throughout the paste. When warmed to room temperature, flavors of sweet milk along with nutty and parmesan notes dominate the palate. A notable lactic bite on the finish leaves you pining for more. Its striking white hue renders it a visually stunning as well as a delicious addition to any cheese tray. It will also melt nicely to create decadent grilled cheese, croque madame, or croque monsieur sandwiches like you have never had before. The creamery suggests that you enjoy the Butterkäse with hearty, crusty French or Italian style breads and hearty, homemade soups. Suggested wine pairings include both dry white and red wines, such as chardonnay, sauvignon blanc, and syrah/shiraz. Beer pairings include aged lagers, IPAs, porters, or stouts.